The Drummer and the Keeper is an Irish movie directed by Nick Kelly. He gifted himself two young talented and strong actors. Murphy plays the role of Gabriel, a drummer in a rock band who has a bipolarity issue. A character full of ambition but who can’t seem to overcome his illness. A fight his mother lost. Gabriel will then be forced to play in a football team where he’ll meet Christopher, the keeper meant as the goal keeper. Christopher played by McCarthy is a 17 years old boy with Asperger’s. Both of them will then be forced to keep a good relationship and from nowhere a friendship will be born, a sort of bromance. These two don’t have much in common, and therefore Gabriel will start to appreciate Christopher. Every scene means something, everything is important, this is probably due to Kelly’s experience in commercials. In consequence of his career in advertising, the scenes are all focused on the main characters, with few props, few extras, many close-up shots, that allow us to see the emptiness of the characters. Gabriel and especially Christopher don’t seem to have feelings, they cannot express them, they don’t know how to. Then, one of the main scenes takes place, my personal favorite, a full shot scene in Christopher’s garden. Gabriel starts to outcome his disease, and in few words, everything will be said. A very moving movie, with an eclectic soundtrack, poor landscapes so that we can focus on the two main characters. The Asperger’s symptom is one of the main subjects, played very well by McCarthy, who said in an interview that he got to read a lot about it to be as realistic as possible. What is very interesting is the fact that Christopher doesn’t know how to express his feelings but ironically, he is always doing something, he cannot stay still, and this is why when Christopher is in a scene, it’s always a full or a medium shot. I would definitely advise you to watch this movie, full of fights, in a mist of emotions. I will attempt, in the following lines to communicate the delightful experience I had while watching the movie The Drummer and the Keeper. It is the story of a strange friendship between Gabriel (Dermot Murphy) a drummer in a rock band diagnosed as being bipolar and Christopher (Mc Carthy) a young man in a residence for disabled minors, diagnosed with Asperger’s Syndrome. As regards the two ascending actors, their performance was very convincing. Low angles shots show Gabriel’s exhausted face due to drugs consumption while full shots show how much Christopher in is control and reserved, with his fists closed tightly and a steady stiff posture. The two young men meet in a pedagogical soccer team with other disabled young people, and develop friendship after a fight over score and rules. The chemistry they display is a heartwarming vision of relationships for people who have a hard time connecting with others. In a scene where the boys are practicing penalty shots, Christopher and Gabriel are standing one in front of the other, they are the whole field apart, there’s a soothing sunset in the background, just behind the silent residence. The young men look at each other in peace, enjoying the sweetness of their relationship: a friendship in birth. Later on, the protagonists will endure much turbulence as regards loyalty and honesty problems, but it is extremely catchy to follow their evolution. The movie’s soundtrack is as varied as Gabriel’s state of mind, eclectic with up going tempo, as much as sad songs. At last, the director Nick Kelly aims to raise awareness, to neutralize the taboo surrounding mentally ill people, to show us they have as many problems as we do, and just in the same way. It is a step towards a social improvement he made for the general well-being of the world we live in, but specifically because his son suffers from Asperger’s as well. The movie we watched is called The Drummer and The Keeper directed by Nick Kelly. The story is about two teenagers Christopher and Gabriel. Both of them suffer from mental disorder. Christopher is the goal keeper and suffers from Asperger’s Syndrome. He has difficulties to deal and socialize with other people. Moreover, he looks a little uptight due to his strong character because of his disease. As regards Gabriel, he was a drummer in a rock band. After his psychologist’s medication, which affected his skills as a musician, he has been “fired” from his band. Christopher and Gabriel first met during a football practice. Their coach forced them to become friends, which was not that bad at the end of the day. The Drummer and The Keeper is a moving film that makes you reflect a lot about disabled people after watching it. As far as I am concerned, I felt extremely sad for them. Both Dermot Murphy (Gabriel) and McCarthy (Christopher), two unknown actors, played an outstanding role. Their performance, the music chosen by the director and the production, the shots… and more, fitted perfectly every single situation in the movie. Furthermore, the characters’ names were chosen as regards their illness or personality. Indeed, Gabriel refers to an Angel and Christopher to the Christ who sacrifices himself for everyone. Even if their personalities do not match, both of the protagonists end up making us feel either better, or sadder, depending on each and everyone’s personality. Last but not least, what makes the difference between this movie and the others is the link between the director and his touching movie. Being a commercial and not a film producer, and wanting to express his sadness (or happiness, depending on the point of view) concerning his son’s mental health (which was suffering from Asperger’s Syndrome) added more emotion to the movie. However, and unfortunately, the film could not become a blockbuster because nowadays, in order to be successful, movies must be a production of an important film producer, with well-known actors performing in it… which I strongly disagree with because The Drummer and The Keeper, an Irish movie, with unknown actors, deserves as much as some blockbusters, to be a huge success. Finally, I would sincerely advise this movie to everyone: teenagers, adults and even elderly, because it deals with actual problems and disabled people which we should take care of instead of denying them or ignoring them due to their “unapproachable” personality. By Nour El Guerchi TS2. On Sunday, 4th November, the Terminales watched The Drummer and the Keeper. The Drummer and the Keeper is a drama, coming of age film directed by Nick Kelly. It follows the lives of a young adult, Gabriel, who aspires to be a drummer and teenager Christopher, both struggling with mental health conditions. Both men meet at a football stadium, where young adults learn to express their anger in a healthy way. Gabriel was sent by his psychiatrist to help alleviate the symptoms of his bipolar disorder, whereas Christopher was diagnosed with Asperger’s syndrome. There, a story of friendship and healing begins. Firstly, the score used evokes the importance of rock and roll for Gabriel. It represents his struggles when it is fast-paced and acts as a translator of the protagonists’ emotions. The film efficiently portrays the struggles of those dealing with mental health issues. For starters, Gabriel has to face the hardship of taking pills which drain him and decrease his creativity. This results in him playing the drums differently. On the other hand, Christopher learns to break free of the confinements and habits that made him comfortable, to experience life fully. He does that by forcibly helping Gabriel and his bandmates load their equipment in bars, a place that he will cherish. At the beginning, Gabriel is repulsed by Christopher’s misunderstanding of social codes, but they slowly get closer, and in doing so, get closer to the road of recovery. Another theme explored by the film is the effect of someone’s upbringing and family situation on their quality of life. The two protagonists learn to deal with their trauma in a healthier way: Gabriel, by quitting his self-destructive habits and moving on and Christopher, by learning independence and accepting his current situation. The film manages to de-stigmatize mental illnesses and sheds a light on the importance of therapy. It attempts to teach the audience to treat others gently, since suffering can be hidden. It depicts a realistic situation: the road to recovery is full of obstacles, healing is a continuous journey, full of obstacles. On Sunday, November 11Th I had the pleasure to attend a film at Zawya cinema in downtown Cairo. It was an Irish drama entitled The drummer and the keeper. While I personally don’t enjoy drama that much, I found this one most enjoyable. In these few lines I will expose what I felt the film executed perfectly as well as what I think could have been better. The plot revolves around an unusual friendship between two characters who both have mental issues. The film’s protagonist Gabriel is a bipolar drummer in a rock band who is having trouble dealing with the aftermath of his father’s suicide. He meets an autistic 18-year-old, Christopher. A friendship develops between them and as the spectators we have the pleasure to watch their friendship evolve. Eventually Gabriel’s bipolar attitude gets out of hand and he does some things that lead him to be locked up in an institution for mentally ill people. This is a strong rupture within his relationship with Christopher whom he hurts badly as well as with the other characters of the film. Overall, I liked the film. The acting and the filming were good, but I was disappointed with the plot ending. I thought Gabriel had been unjustly treated by the film’s other characters and deserved composition. This film was powerful in that it had an emotional impact on me and rather to my surprise, the audience I was sitting with remained unusually quiet. This film exposes another human story where tolerance and goodwill are triumphant. In my view this film is aimed at an adolescent audience since the characters are Irish young men. It was good on its cinematographic aspects but lacked in solidity and coherence when it comes to the plot. 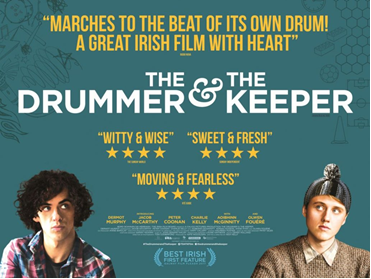 The drummer and the keeper released in 2017 by Nick Kelly is still available to watch in Cairo an online, which I highly recommend. This Irish movie is realistic and filled with emotions. Gabriel, the protagonist is a bi-polar drummer of a rock band “. He finds himself in a catastrophic situation after both his mother and his father died. While he is forced to attend football matches to get better, he meets a teen suffering from Asperger’s syndrome: Christopher. Both protagonists find themselves in an unwanted friendship that leads to a great ending. I highly recommend this movie to all the people that are interested in knowing more about diseases… but don’t have time to read or do research. Please note that for those that don’t understand the Irish accent won’t appreciate this movie. I wouldn’t recommend it for the ones that don’t like loud noises or get emotional. I predict that after you watch the movie, you’ll probably get emotional but certainly you’ll be happy, not only you’ll find joy in life again, but you’ll be thankful for the life you have.